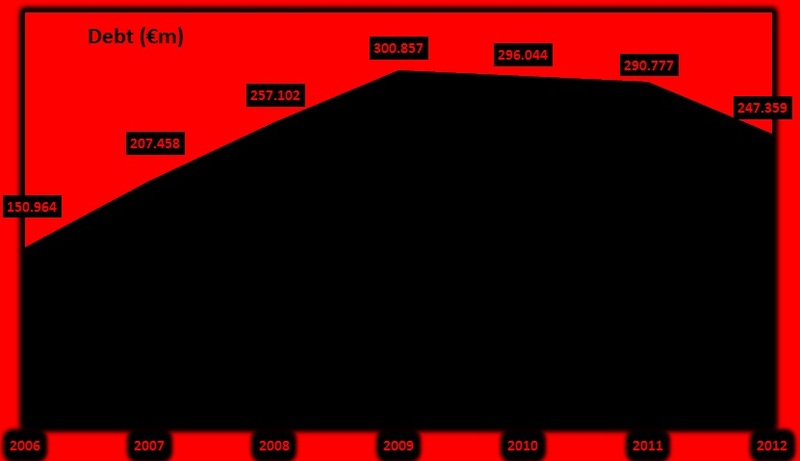 Milan’s turnover/revenue trend since 2006. Above you can see Milan’s turnover year on year. Note that the 2006 accounts were for AC Milan SpA only (I.E. the football club). From 2007 onwards Milan’s accounts changed and they began reporting both Gruppo Milan – the football club plus Milan Real Estate and Milan Entertainment – and the football club on its own. I have used Gruppo Milan figures where available. The trends above demonstrate the difficulty Milan have in their attempts to improve revenue. Matchday, TV and commercial are the three primary income streams – the only other source featured on the balance sheets are player sales, which is not how the club want to be augmenting turnover. Matchday is fairly consistent each year, but compared to clubs across Europe is incredibly low and it is impossible for Milan to grow this stream without owning a stadium. Milan have limited control over TV income, particularly since the introduction of the new domestic TV deal three years ago. The domestic rights are a complicated beast – here is an article I wrote for Football Italia in 2012 explaining how they are calculated. The dip from 2009 to 2010 represents the point at which the new shared TV deal was introduced in Italy, which hit the TV revenue of all the big clubs. Milan were no exception, and this stream is unlikely to reach levels of years gone by without solid runs in the Champions League to improve the UEFA proportion of this figure, combined with continued failure of other Italian clubs in the same competition. All of which leaves commercial income, the one stream Milan have total control over, and as the graph shows, the stream that the club have worked tirelessly to improve when it became apparent Serie A would switch to a combined domestic TV deal. Milan’s partnership with Infront – a sports sponsorship management company – started in 2010 and saw a restructuring of the club’s sponsorship strategy, and consequently a rise in commercial revenues that are now the best in Italy and on a par with Europe’s other top clubs. One of the biggest, if not the biggest, reason for the cost-cutting is the Milan wage bill. 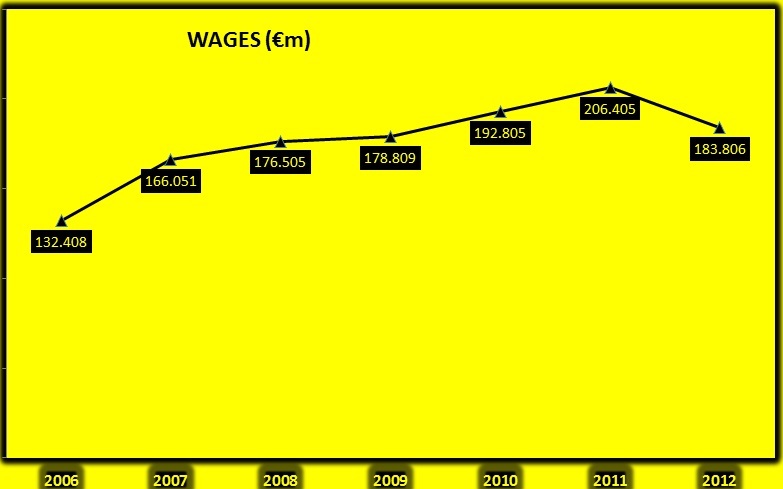 Their efforts in cutting salaries since the nadir of 2011 are evident in the graph, with the €183.806m spent on wages in 2012 representing 55% of the overall turnover for that year, though that was aided by player sales increasing the value of the latter. The UEFA Club Financial Control Body, who assess a club’s ability to meet the Financial Fair Play regulations, have the right to request further information from a club if their accounts show a wage bill that represents more than 70% of total revenue. If you take away the income from player sales from 2012’s total revenue, that wage bill would represent 67% of that figure, so more cutting is needed. The diagram on net debt speaks for itself really – mounting levels of unsustainable spending, primarily on salaries, took its toll. But as with salaries, the club are taking steps to reduce net debt levels. The UEFA Club Financial Control Body can request more information from a club if their net debt exceeds 100% of total revenue. Thankfully this wasn’t the case in 2012, but in three of the last seven accounts (2008, 2010, 2011) the net debt has been well above revenue.